There’s something striking about an undulating roof. It’s an old-world charm that immediately captures attention and delivers a deep sense of intrigue. At Custom Shingles, we use superb craftsmanship to create intricate designs and patterns for bent shingle undulating roofs. We use our depth of experience and knowledge to create dramatic and flowing shingle courses that move seamlessly from one roof plane to another. The result is a type of roof that visitors could spend hours looking at and enjoying the detailed craftsmanship. 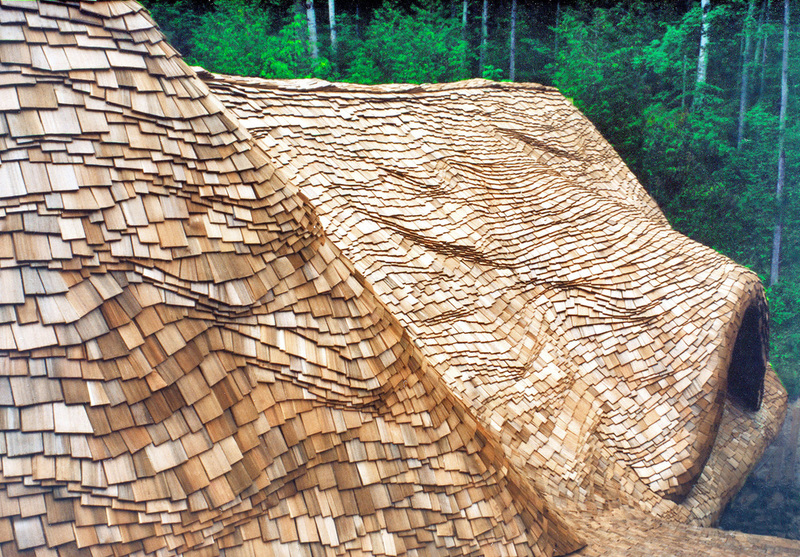 Wood is the best material to create designs like those on undulating roofs. They are lightweight and easy to cut and craft, which makes them ideal for artistic expression like that captured in a bent shingle undulating roof. This art form continues to grow and evolve, too, as architects and other craftsmen explore new and innovative ways to use wood to create awe-inducing designs. At Custom Shingles, we are committed to being a leader in this evolution. We use carefully refined processes and best practices to create beautiful undulating roof designs, and we are always working at our craft to improve and break through to the next plane in undulating roof design. You can explore some of our recent work on our Portfolio page. 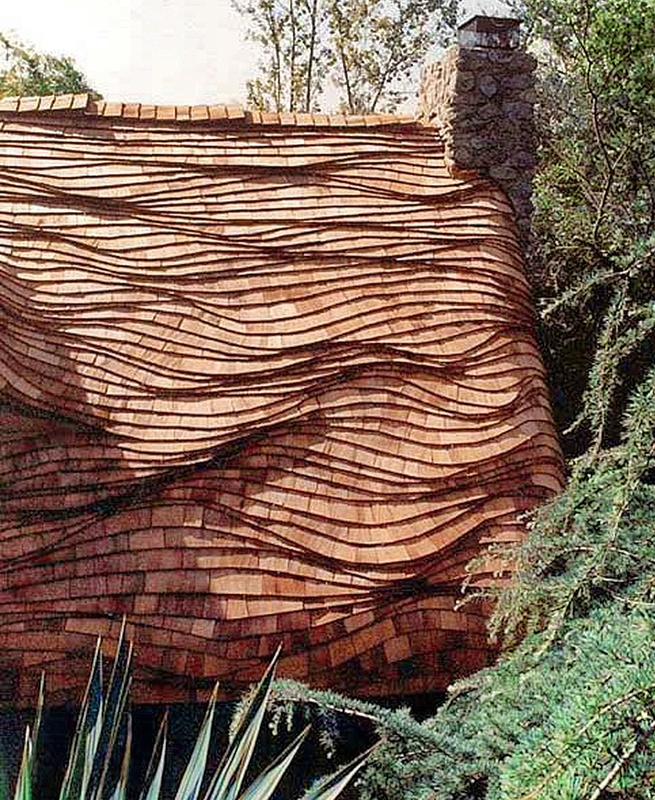 A beautiful undulating roof relies on quality wood materials to create each individual shingle. At Custom Shingles, we use our experience and the utmost care to steam bend each shingle without compromising its integrity. The result of our careful process is a collection of cedar or teak shingles that can be used to create beautiful undulating roof designs that also offer long-lasting durability. Indeed, cedar shingles can last 30 years or more, while teak shingles can last up to 80 years — far surpassing the durability you get with more common modern shingle materials. Not only does your wood roof deliver incredible beauty and charm, it also offers incredible value and long-term performance. Undulating roof designs look most attractive on older, era-appropriate structures. When replacing important features like roofing on older homes and buildings, it's important to work with heightened care and attention to detail. At Custom Shingles, we have a depth of experience and knowledge when it comes to installing a steam bent undulating roof on an older home or structure. We use this experience and knowledge to successfully install bent wood shingle roofs, and we can also use our expertise to provide ongoing maintenance and service that keeps your undulating roof looking clean and new. We use a proven technique for carefully washing moss away from your undulating roof, and we use a special solution that helps guard against future moss buildup. When you want installation, repair or maintenance of a charming undulating roof, make sure you choose a service provider experienced in working on bent shingle roofs — an experienced provider like Custom Shingles. Contact us today to request a quote or learn more about your undulating roof options.